Bristol Tigers president Boyce Cox explained his job to writer Hank Davis in Davis' book Small Town Heroes. Cox' hard work with the club, Davis noted, had produced league Executive of the Year honors three times in 14 years. And he did it all without taking a paycheck. "They couldn't pay me enough to do this job," Cox told Davis. "This is hard work, and there are some long days here. But the truth is, if I didn't have this to do, I'd be climbing the walls at home." Cox continued his hard work for the Bristol Appalachian League entry for a quarter century. 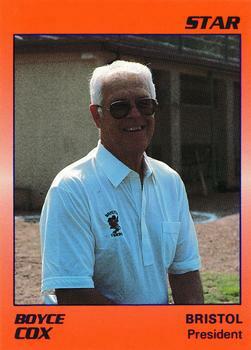 He continued to serve as team general manager right up until his passing in 2007 at the age of 81. His hard work with the club also gained him the honor of the very field on which his Bristol teams played named in his honor - Boyce Cox Field at DeVault Memorial Stadium. Davis' long involvement in the game began in the 1940s, when the Bristol native played briefly for Bristol. He is credited as playing in 1943 and 1946. In between, he served in the U.S. Navy's Sports Department during World War II. He then went on to a career with the post office. He also helped develop Little League baseball in the Bristol area. He joined Bristol in 1980 and became the Bristol team's president in 1983 and was credited with bringing the franchise back from a period of low attendance, according to MiLB. "One of the pillars of this league," Appalachian League President Lee Landers told MiLB of Cox after Cox' 2007 passing. "He was a mentor for everyone in this area and a chairman for every committee you could think of in this league."